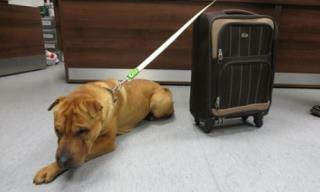 (Newser) – Abandoning an animal is wrong—even if you leave it with its belongings, say animal welfare authorities in Scotland, who are trying to trace an owner who left a young dog tied to a railing outside a train station next to a suitcase that contained a pillow, a toy, some food, and a bowl. The 2-year-old male Shar-Pei crossbreed is named Kai, the Scottish Society for the Prevention of Cruelty to Animals determined after checking his microchip, but the owners who microchipped him say they sold him online in 2013 and don't know the new owner's address, reports the Guardian. This kind of thing is symptomatic of our society, which encourages us to see people and animals as objects to be used or profited from, rather than as living beings to be treated with care and respect. Animal shelters are overflowing with "inconvenient" pets, abandoned or abused by their owners. If we're the most advanced life form on the planet, I'd hate to see what is in second place. At least they were kind enough to also put his stuff there. Maybe they could not care for him. However, they could have easily taken him to a shelter unless they didn't have one nearby and maybe no way to get him to one. We only dumped one animal that I know of. It was this demented cat who came into our neighborhood. Darn thing would wait on people's roofs and jump down on your head as you left your home. It was Biblical possessed like those pigs like in Matt 8. So we captured it with a Havahart trap. We then took a very long trip way out into the boonies and dumped it. Hey, nothing was going to hurt it.